noted: All work and no play? So Working day at Crufts has come and gone... Me, Martha, and her baldish patch stayed at home and had a lovely day getting as muddy as possible! Much more fun for a Newfy! Martha also had her jabs today and was admired by all of the vets clients and staff! I'm sure we'd have won! Had lots of fun watching the 'proper' dogs today on the Crufts program! ;-) The Newf was gorgeous and had an amazing amount of coat! 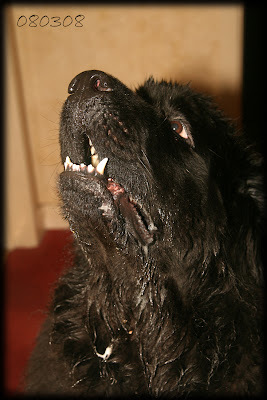 Just in case you think Newfs look naturally neat and clean, here's a slobbery and wet Lola after her walk in the rain this evening! It's funny how you feel really torn between wanting your own breed to do well in the later stages of the competition and hoping they don't. There is such a risk of any breed that wins Crufts becoming over popular... unsuitable people thinking a Newf might be right for them and the possibility of unscrupulous breeders popping up to take advantage of increased demand. Newfs demand such specific and special care and a special (possibly a bit mental!) owner to take on the size, slobber, mud and attitude of these special creatures. If you fancy one, feel free to give me a shout... you can come over and mop my muddy kitchen floor, fill some muddy holes up in the garden and wipe the slobber off my laptop to try a New for size! You never fit a Newfy to your life... you tailor your life to fit them! Gotta love em! I've also this weekend been putting a new and upcoming X-Cut trimmer through it's paces... it's fab! So easy to use and so, so accurate. Look out for it in a store near you some time later in the year! Out of interest.... if you had your choice of any colour, what would you choose? Leave me a comment and let me know! but then as everyone in DC knows everything for me has to be purple!! Mmmm would have to be bright pink or lime green or a mixture of them both with big spots on it!! Trimmer trimmer , did I hear the word trimmer ????? I am after a new trimmer , how much later in the year would they be ?!!?!!?? Cant wait to hear more about them , colour wise I guess something brightish , not much help is it .